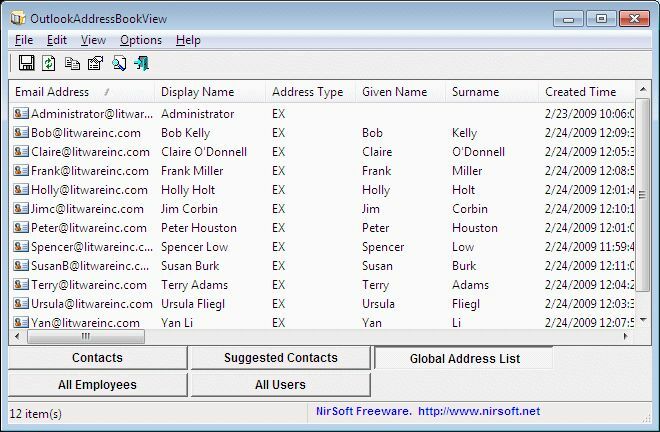 NirSoft OutlookAddressBookView (64-bit) is a tool to extract information from Microsoft Outlook. It can retrieve information on all recipients stored in the address books of Microsoft Outlook, displaying the following details of every entry; Email Address, Display Name, Address Type (MS-Exchange or SMTP), Street Address, Phone Number, Created Time, Modified Time (Works only with address books of Exchange server), and more. You can exports any of all of the results as tab-delimited/comma-delimited/xml/html files. NOTE: This version is for users of Outlook 2010 x64 only. If you are using an older version of Outlook, then click here for the correct version.